A total of 27 members of aircrew from the Squadron, upon standing on occupied soil, using their training, cunning, determination and their utter trust of others, not only successfully avoided capture but also managed to return to mainland Britain. To a man, they received help from locals, whether they be members of the public, resistance or escape lines. These, to a large part unknown individuals faced potentially far higher penalty for being caught assisting a flyer than that airman himself and as such, this list will represent where ever possible their story as well as the airman involved. The target was enemy troops and armour concentrations at Mare De Magne, being made in direct support of the Allied Armies advance in the Caen area. Seventeen aircraft were detailed, all of which took off and dropped their bombs with the aid of markers, and a concentrated raid developed. Opposition from A.A. fire was very slight, but a few enemy fighters were active. One aircraft had an inconclusive combat and another (Captain 150278 .F/O. G. Brunton) failed to return. “My flight and experiences are the same as F/O Brunton up to the time that I baled out. I landed north-east of St.Sxlyestae Le Co [Sp] about 03:00 hrs on the 8th of August 1944. I hid my harness, mae west and parachute, and then lay up in some thick brambles on the hillside nearby. A few hours later I came down from the hillside and sat on a fence near a farmhouse. Shortly afterwards a young girl came up to me and told me that F/O Brunton was sheltering in the farmhouse. She took me to meet F/O Brunton and from this point my story is the same as his”. Left France the 28th of August 1944. Returned to the United Kingdom: 28th of August 1944. The following is the transcript of F/O Brunton’s debrief with M.I.9 (M.I.(/S/P.G.(-)2154). “I was pilot of a Lancaster which left R.A.F. MEPAL to bomb a tank concentration in a wood near CAEN (France, 1:250,000 Sheet 8, U 06) at 2200 hrs. on 7 Aug 44. We had dropped our bombs when we were attacked by a JU.88, which set the starboard outer engine on fire, we failed to extinguish the fire. I then gave the order to abandon aircraft. I baled out and landed near a farm five miles West of CORMEILLES (N.W. EUROPE 1:250,000, sheet 7, Q6598). This was about midnight. I sprained my ankle on landing and had previously been deafened by the explosions. As soon as I landed a farmer came running up to me and told me to come with him to his house, where he gave me food and drink and civilian clothing. He then went back to the field and collected my parachute, harness and mae west, which he hid in a loft and subsequently, I think, burnt. I spent that night there. The following morning the farmer came in with Sgt. Board (S/P.G.(-)2192). The farmer said that he and his daughter were going to CORMEILLES to try to contact the Maquis. The daughter came back about 1100 hrs. and told us that the Gestapo were looking for us, and that they had shot ten Frenchmen in CORMEILLES in reprisal for their having shot two Germans. She said that her father had been taken by them but he was released about 1500 hrs. the same day. We left the farm and hid in a ditch in the bottom of a nearby valley. About 1900 hrs. another Frenchman appeared and told us to come with him to another farm just East of CORMEILLES, where we spent the night in a barn. This barn appeared to be the local hide-out for the Maquis. Here we were questioned very thoroughly. Next morning (9 Aug) at about 0300 hrs. the farmer’s son guided us to a little shack on the outskirts of ST. SYLVESTRE-DE-CORMEILLES (@6697) about 2 kms. East of CORMEILLES. There was a member of the Maquis (an Alsation) living there with his wife, and sheltering two members of the 9th Parachute Div., Sgt. Smith, E., and Cpl. WILSON, G., and F/Sgt. CHARTERIS, 57 Sqn., R.A.F. We stayed in this shack for about three days. The head of the local resistance group fed us during this time, bringing the food up from his house. We spent the nights hidden in the surrounding woods merely going into the shack for meals. On 12 Aug the whole resistance group, with their wives, families, and belongings mustered at the shack, because we had been betrayed to the Gestapo by a woman collaborator in return for the freedom of her son. I do not know whether she gave them out names or not. We all left that night and walked about 7 or 8 kms. Through the woods in an Easterly direction, having an armed guard and patrols out to watch for Germans. We arrived at the barn where we stayed for the remainder of that night and the following day. The next night we moved on to another barn about ½ km. away where we stayed for nearly a week. On the night of 19 Aug, when I was on patrol I came across a German tank crew who were repairing their tank in the wood. On the following Monday (21 Aug) some German artillery officers came and sited a gun close to us in the wood, so we decided to move back to the shack near ST. SYLVESTRE. We moved that night, travelling across country. It was raining very hard so we spent the remainder of the night in the shack. The next morning ( 22 Aug) a German battalion moved into the village, so we took to the woods again. During the day a captain of the Maquis came and told us that we had better give ourselves up as he thought we could not get through, and the resistance group were dispersing. I, being the only one who spoke French, went to the head of the resistance group and told him we would try and walk to the British lines by ourselves. He would not hear of it and said that he and his family and another young couple would continue to look after us. The young couple took us to a barn where we stayed for about an hour, when the head of the resistance group came rushing up to say that there were some German troops coming up the valley towards us from ST. SYLVESTRE. We crept out to his house on the outskirts of the village, where he hid us in a secret loft which communicated with his bedroom. On 23 Aug the Germans retreated from ST. SYLVESTRE, leaving a mortar platoon with their gun about 100 yards below the house. We spent that day and the following night in the loft. The next day (Aug 24) we crept out into the woods and I spent the following night in a dry cattle pond on top of a hill. Meanwhile the battle was taking place all round us. The next day (25 Aug) we walked down into CORMEILLES and found it had been taken by British troops”. Lancaster Mk.III NE148 AA – H, was one of the aircraft intercepted by night-fighters en route to the target. It was critically damaged by such an attack in which the Rear Gunner was killed; Mid Upper Gunner seriously injured, and one engine put out of action. The bomb load was jettisoned and the Pilot initiated a return to base. He ultimately was unable to prevent the aircraft losing height and ordered the crew to bale out. Minutes later NE148 crashed close to the village of Yevres, a mile East of Brau. Both the Pilot and Rear Gunner, who died, were buried in the village cemetery. The remaining six who baled out, all successfully evaded capture. “My story up to the time of baling out agrees with that of F/Sgt Sampson. When I baled out I hit my head on the tail plane and lost consciousness until very near the ground when I pulled the ripcord. The parachute took the weight but I hit the ground very heavily. After about two hours (I was badly shaken) I found myself crawling along the road and finally crawled into some bushes and lay there. I lay in the wood until 16:00 hrs and heard a horse and cart coming along. I called out and a man came over to me. We both thought my leg was broken and he indicated I should crawl back into the bushes and he would return. He came back in a couple of hours in his cart. I was then taken to a barn where I saw F/Sgt Sampson and F/Sgt Raynel. From here my story is the same as that of F/Sgt Sampson until we parted near Chateauudun. His journey was arranged. I was sheltered until the Americans took the village and sent me onto the British lines which I reached on the 15th of August 1944”. Returned to the United Kingdom: 17th of August 1944. Returned to the United Kingdom: 25th of August 1944. Lancaster Mk.I LM268 AA – D, was brought down at 00:15hrs by a night-fighter near the southern end of Sjælland Island, Denmark. The aircraft crashed onto a farmhouse near the township of Orslev, killing five members of the family. Only two of the crew, the Fight Engineer and Air Bomber, succeeded in baling out, the former evading capture and the latter, although badly hurt, was aided by locals and hospitalized before being turned over to the authorities. Returned to the United Kingdom: 27th of September 1944. Stirling Mk.III LJ442 JN – F came under attack from a night-fighter (Lt Otto Fries, 5 /NJG1) a short time after take-off while en route to the target over the Belgian coast. After a series of attacks by the fighter causing considerable damage, fire broke out in LJ442’s starboard wing and a crash-landing attempt was made by the Pilot at Horrues, North West of Soignies, Belgium. Only the Pilot, Navigator and Air Bomber survived. Parker and Griffiths evaded capture but Hyde, who was seriously injured, was taken as P.o.W. The four who died were buried at Chievres, 10 miles from Horrues. Returned to the United Kingdom: not known. Lancaster Mk.III ND756 AA – M, was shot down in flames by a night-fighter over France, crashing at 01:25hrs close to Millery village, 3 miles North of Pompey. All but the Flight Engineer, Navigator and Rear Gunner died and were buried at the Millery cemetery. The surviving three crew members had baled out of the burning aircraft successfully. Sgt Hyde (F/E) and F/S Kirk (R/G), evaded capture and escaped but F/S Grieg (Nav) was captured as prisoner of war. HK553 was attacked by a night-fighter to the west of the target and crashed near Tillièrs- sur-Avre, where six of the crew were buried. Sgt Jackson, RAF, the mid-upper gunner, survived the crash and successfully evaded capture. Departed Bayeux 26th of August 1944. Returned to the United Kingdom: 7th of August 1944. EH938 was brought down probably by night-fighter action in the German air defensive ‘Box’ when returning to base. The aircraft crashed at Lommel (Limburg), Belgium. All but one of the crew died and funerals were held at St-Truiden. Their graves are now in Heverlee War Cemetery. Sgt R V Johnson, the Air Bomber, was uninjured and able to parachute to safety. He successfully evaded capture. Ralph Valentine ‘Val” Clingham Johnson, Air Bomber with the Parkin crew. Sole survivor and evader after an op to Munchen-Gladbach on the 30th August 1943. 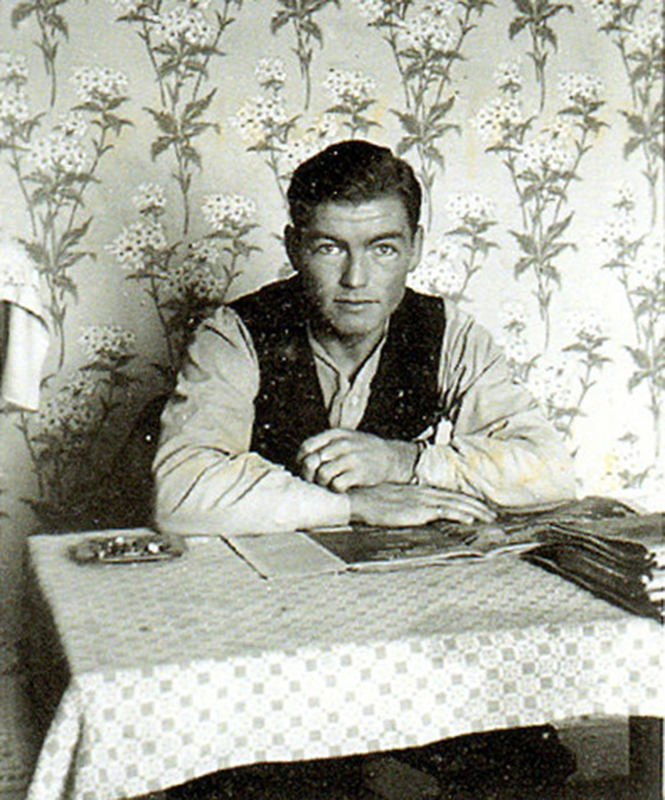 The photograph was taken while he was staying with the Georgeton family in Sillery, 13 – 15th October 1943. Many thanks to Tony, Jenny, Fred, and Michael for contributing to this incredible tale of survival and evasion behind enemy lines. Tony first contacted me about his Father, Ralph Valentine “Val’ Clingham Johnson, Air Bomber with Victor Parkin’s crew – the sole survivor of the crew after their aircraft was (most likely) attacked by a German night fighter over Belgium. The story and details of Val’s evasion and the bravery of those individuals that assisted him and other airmen like him has been provided by Fred Greyer and Michael LeBlanc. F/S Victor Trevor Parkin, RNZAF NZ421090 – Pilot. Died age 21. F/S Terrence Watters, RNZAF NZ417299 – Navigator. Died age 21. Sgt. William Hadley Horrigan, RAFVR 1176649 – Wireless Operator. Died age 29. Sgt. Trevor Silcock, RAFVR 1582836 – Flight Engineer. Died age 20. Sgt. Richard Frederick Grove, RAFVR 1581242 – Mid Upper Gunner. Died age 22. Sgt. Anthony Francis Saunders, RAFVR 1394719 – Rear Gunner. Died age 20. During the night of the 15th July 1943, two MI9 agents were parachuted into southeast Belgium (Province of Luxembourg) near Suxy. Dominique Edgard Potier was a Belgian airforce officer, who had arrived in England in March 1942. Accompanying him was Conrad Lafleur, his French-Canadian radio operator. At this time, many allied aircrew, on bombing raids to Germany, were being shot down over the Belgian Ardennes. Potier’s mission, known as Mission Martin in Belgium and the Possum Line in France, was to organise the recovery of these airmen and shelter, feed and provide them with false identity documents, before moving them to safe houses in and around Reims in Northern France. Unlike the Ardennes, this area was suitable for evacuation by air, using Lysander aircraft. 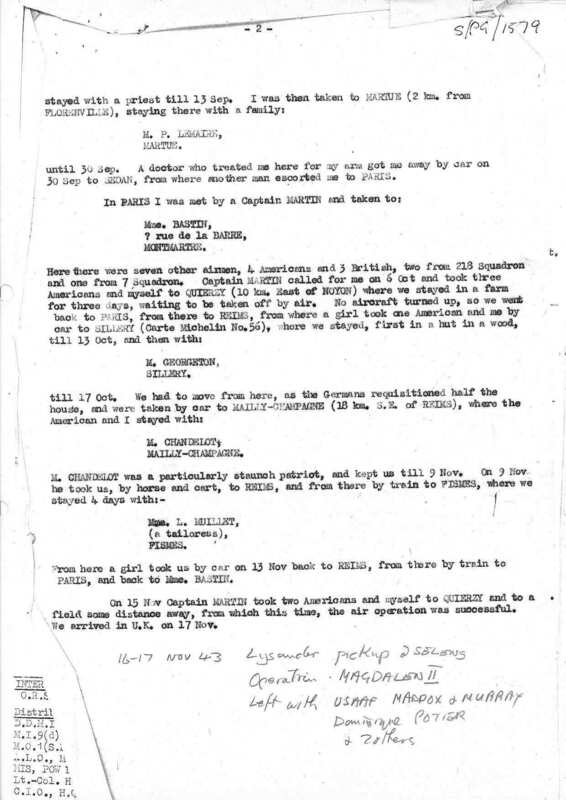 What follows is a transcription of this interview document with detail added where available. Walked west for approx. 4 hours. “I was a member of the crew of a Stirling bomber which left Mepal, North of Cambridge, on 31 Aug at midnight to bomb Munchen-Gladbach. We reached our target and bombed our objective at 0210 hrs. On the homeward journey, there was a violent explosion in the aircraft. I remember reaching for ny parachute, but do not know how I got out. The next thing I remember was that I was in the air and in a cloud. I had severe wounds in one arm, one leg, and my face. I buried my parachute in a hedge and ran along the rain road in a westerly direction. When it became light, I hid in a hedge in which I remained all day. At dusk I worked with my compass and. walked West for about 4 hours. My leg started to give me trouble and I lay low again in a bush in a field”. At 07:00 headed west again, reaching a wood. Stayed there all day and that night. Stayed at a cottage in Exel (North of Hasselt, Belgium), where identity was confirmed by an English woman. Taken by two gendarmes to M. Sols-Lensken, 66, Markt Str, Exel.Visited by a doctor for a bad septic arm and knee. (husband, wife, and child of six)”. Taken by train to Neerpelt. Stayed in a small cottage with Mme. Spelters, an old lady of 66 with six sons. “The men, who were gendarmes in plain clothes, left me here. I was visited by a doctor and nursed by the people for a bad septic arm and knee. I was given plain clothes and, on about 6 Sep, a man came and took me by train to Neerpelt to a small cottage. (old lady of 66, six sons)”. Taken by train to Antwerp. Stayed for a few hours at the house of M. Daelmans, 15, rue d’Orange. Went by train to Brussels, with M. Daelmans, and from there to Virton, in the Ardennes, Province of Luxembourg. Stayed with the local organist, M. Georges Hennaut. Left by train for Florenville (28 km. N.W. of Virton). Stayed with priest. Driven, by Louis Gerard, to Martue (2 km. from Florenville), and stayed with Paul Lemaire. “Until 30 Sep.A doctor who treated me here for my arm, got me away by car”. Driven by Dr. Albert Pierre to Sedan. Then escorted, by another man, to Paris. Met by Edgard Potier and taken to Suzanne Bastin. Here there were seven other airmen, 4 Americans and 3 British. Here there were seven other airmen, 4 Americans and 3 British, two from 218 squadron and one from 7 squadron”. Taken by Potier to Quierzy (25km NE of Compiègne), with three Americans (probably John Desrochers, Ellis Klein and Fred Murray (USAAF)). Stayed in a farm for three days, waiting for pickup. Note: there was no scheduled pickup on this date. The next one was scheduled for 16/17 October 1943, which failed. “Captain Martin called for me on 6 Oct took three Americans and myself to Quierzy (10 km. East of Noyon) where we stayed in a farm for three days, waiting to be taken off by air”. No aircraft turned up; went back to Paris and from there to Reims. Taken by Raymonde Beuré with Fred Murray to Sillery (approx. 10 kms South East of Reims). 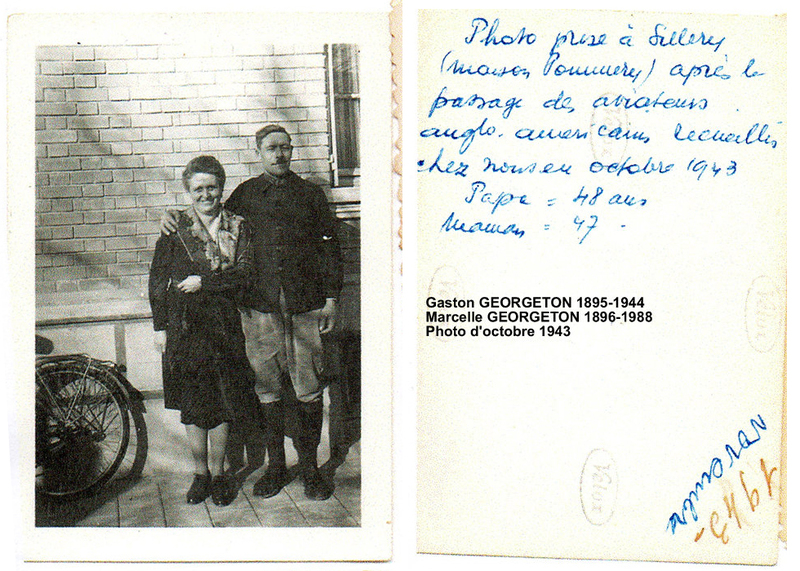 Germans started searching woods for draft dodgers, so moved to the home of the Georgeton’s in Sillery. A remarkable series of pictures of Val and USAF airman Fred Murray, whom Val had met some X days before. I find this images to be quite astonishing. I would have imagined that an evading airman would be constantly on the move, suspicious of everyone. The pictures above of Val and Fred Murray an American airman have a casual, almost relaxed air to them. In some respects, I am amazed that the photographs even exist – I would have imagined that the last thing a family, helping allied airmen escape would want is a camera full of pictures of allied airmen, let a lone a collection of photographs of them! Potier parachuted back into France on the 20th December 1943. It had been his intention to move Possum to Amiens, as the organisation was becoming too “well known” in Reims. However, on the 28th December, as Conrad Lafleur was transmitting messages to London, he was surprised by the Germans. He escaped, but it was the start of a sequence of events that eventually lead to the arrest of Potier. Initially he was taken to Fresnes prison in Paris and then returned to Reims, where after being subjected to considerable torture, he committed suicide on the 11th January 1944. As more arrests followed, the organisation around Reims effectively collapsed. Paris, Amiens and the remoter parts of the network continued operating for a few more months, but were eventually traced and broken up. Georges d’Oultremont and Conrad Lafleur escaped down the Comète Line. Of the 70 helpers arrested in the French sector of Possum, some 60 were deported, of which less than half returned. There are no complete records, but it is estimated some 60-70 airmen had passed through or were being sheltered by Possum at the time of its demise. Whilst the Georgeton family played a small part in Val’s evasion, there were members of the Possum line and fully aware of the risks they exposed themselves to if caught. 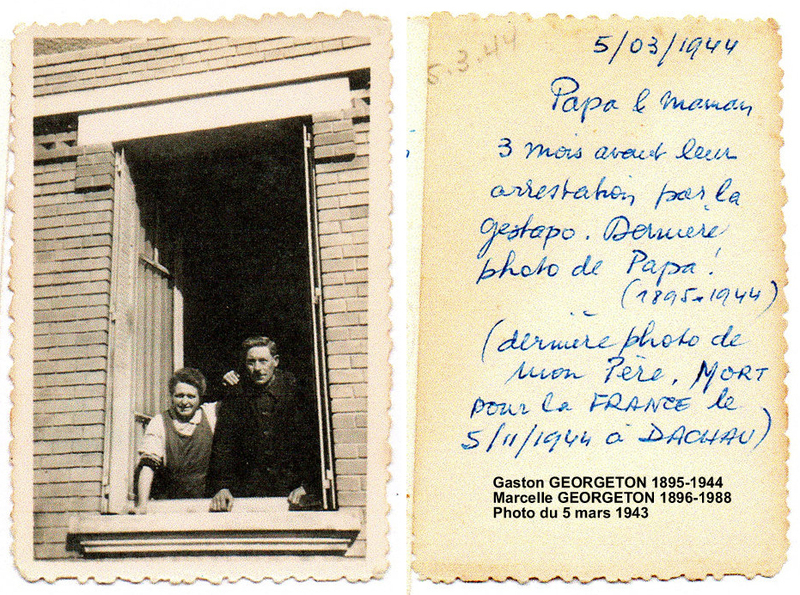 The photographs below show and remember a family who were prepared to act against the Nazis and help the allied airmen who every night flew overhead, themselves gambling that they would never be caught……..
Three of the Georgeton family were arrested by the Gestapo in May of 1944. 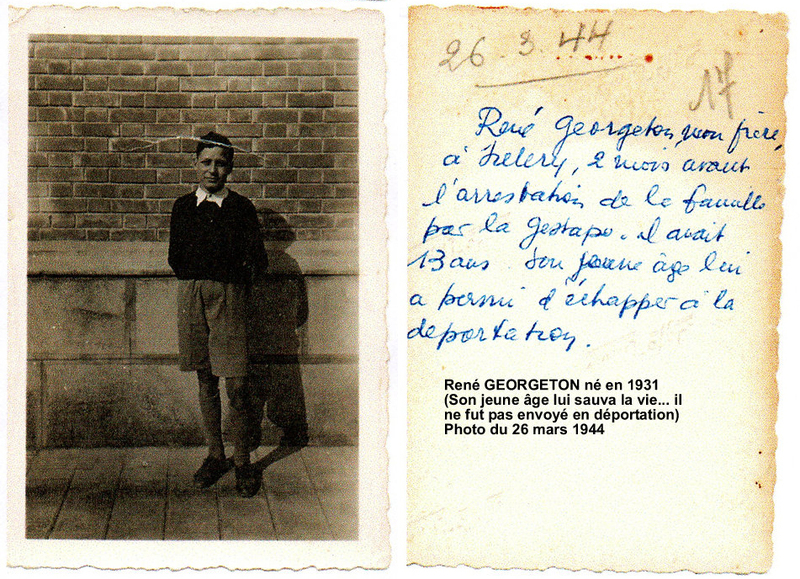 Gaston Georgeton died on 5/11/1944 in Dachau concentration camp. (Gaston?) Georgeton drove them to Mailly-Champagne (18 kms South East of Reims). Stayed with Lea Chandelot. M.Chandelot was a particularly staunch patriot, and kept us till 9 Nov”. Remy Chandelot took them by horse and car to Reims. Train to Fismes with Beuré. Taken by Beuré in a car back to Reims, from there by train to Paris and back to Bastin’s apartment. “From here a girl took us by car on 13 Nov back to Reims, from there by train to Paris, and back to Mme. Bastin”. Train to Chauny and then taken by truck to a small house in the country. Met Georges d’Oultrement (MI9 agent), Charles Breuer and Stanley Chichester (USAAF). “On 15 Nov Captain Martin took two Americans and myself to Quierzy and to a field some distance away, from which this time, the air operation was successful“. Aircraft pickup took place at approx. 02:00 (operation MAGDALEN II). Landed at RAF Tangmere approx. 03:30; met by Major Langley. 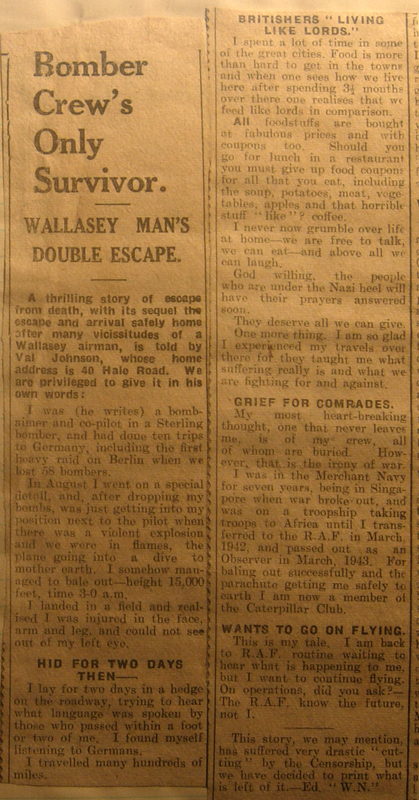 A newspaper article, describing in massively censored manner, Val’s experiences as an evader. One must imagine, given the tense that this article was written sometime towards the end of 1943. A simple, but a very touching note, sent to Val in August of 1945 from one of the many individuals that helped him to escape and return to the UK. Having put this post together, I think this is as much the story of all those brave individuals that were willing to help Val Johnson, as it is about Val’s evasion. R9248 was hit by AA fire shortly after bombing, causing catastrophic damage. The captain attempted a crash landing at St Thégonnec (Finistère), about 8miles SE of Morlaix, France. All but one of the crew died in the crash and were laid to rest in St Thégonnec Communal Cemetery. Sgt Kidd escaped slightly injured from the wreck and managed to evade capture. Returned to the United Kingdom: 8th of May 1943. Six aircraft were detailed to carry out the above operation with Mines of 1500lb., two aircraft returned early, one owing to intercommunication failiure and the other owing to engine trouble and one aircraft failed to return. The remaining three aircraft successfully dropped their mines in the allotted area and the parachutes were seen to open. Some light A.A. fire and a few searchlights were encountered, but they were ineffective. A few enemy aircraft were seen, but no combats took lace. There was thick cloud in the mining area although visibility was fairly good. Navigation was very good. Stirling Mk.I BK646 captained by F/O J.L. Edwards failed to return. BK646 was shot down by a combination of flak and a Me109 night fighter, attempting a crash landing at Moulines-la-Marche, SSW of Brettville-sur-Laize, France. With a loss of one engine and damaged ailerons, the captain ordered the crew to abandon the aircraft. All except Edwards got down safely, with Sgt’s Dunnet, Rawlinson, Jones, and Maxwell being captured as prisoners, and P/O Kirby and Sgt Sansoucy successfully evading capture. F/O Edwards did not survive and was laid to rest in the Canadian War Cemetery. ND756 was shot down in flames by a night-fighter over France, crashing at 01.25hrs close to Millery village, 3 mls N of Pompey. All but the Flight Engineer, Navigator and Rear Gunner died and were buried at the Millery cemetery. The surviving three crew members had baled out of the burning aircraft successfully. Sgt Hyde (F/E) and F/S Kirk (R/G), evaded capture and escaped but F/S Grieg (Nav) was captured as prisoner of war. Returned to the United Kingdom: 2nd of September 1944. NC449 came under heavy AA fire over the target area and received hits in two engines, then began breaking up. Four of the crew were virtually thrown from the disintegrating aircraft and parachuted to safety, however all were captured as prisoners of war. Both Sgt Fell and F/S McDonald were badly injured. P/O Humphries implored the Germans to arrange medical treatment for them. They were sent to a semi-medical centre where they remained for a short period until the arrival of allied forces. Returned to the United Kingdom: 7th of April 1945. Twenty eight aircraft took off to attack the aircraft works at Aulnoye, one of those originally detailed being withdrawn. All crews were successful in attacking the target, and the bombing was well controlled by the Master Bomber. A concentrated raid developed, and several crews were able to identify the target visually. A.A. opposition was very slight, but enemy fighters were more active, and one aircraft (Captain NZ411411 F/O. G. Kennedy), claimed to have shot down two enemy aircraft. One of our aircraft (Captain NZ405801 A/F/L. J. Myers) failed to return. LL921 was brought down by a night fighter at Harveng (Hainaut), 3.5 mile South South East of Mons. The fighter had collided with the Lancaster during an attack from below, causing severe damage to the starboard wing and an uncontrollable fire in the outer engine. All crew baled out successfully on the Pilots’s orders while he managed to keep the aircraft relatively stable. It too then plunged into the ground, sadly killing the Pilot. The enemy fighter also crashed nearby. ME752 was brought down by a night-fighter at 01.15hrs at Heythuysen in the Dutch province of Limburg, 7 mls east of Weert. All crew members, except the air bomber and mid-upper gunner, died in the crash and were first buried in the Heythuysen cemetery but are now lying in Jonkerbos War Cemetery. F/S Burgess survived and was captured as a POW. F/S McGee also survived and successfully evaded capture. “I left in a Lancaster at 2350 hrs on 21 Julu 1944. I baled out at Heizthuizen at 0200 hrs on 22 Jul 1944, the aircraft having been shot down by a night-fighter. I buried my parachute, harness and and mae west. I came to some woods where I slwpt. Here I heard two more planes crash. The next morning I started walking and was right in the centre of the above-named village, which has a population of 3,000 when I was picked up by someone who was in contact with the organization. I was sheltered in various places until along with a party of 11 others we were taken to the Belgian border which we crossed at night and travelled to Masyack. I stayed here for a week with the three others and then moved to Liege where I lost touch with the organization. I was left in a church which was raided by the police but received notification in advance and so walked into the town where I was picked up by another member of the organization and taken to a village called Seraing where I stayed for 3 weeks until liberated”. Returned to the United Kingdom: 14th of September 1944. NE148 was one of the aircraft intercepted by night-fighters en route to the target. It was critically damaged by such an attack in which the rear gunner was killed; mid-upper gunner seriously injured, and one engine put out of action. The bomb load was jettisoned and the captain initiated a return to base. He ultimately was unable to prevent the aircraft losing height and ordered the crew to bale out. Minutes later NE148 crashed close to the village of Yèvres, a mile E of Brau. Both the Pilot and Rear Gunner, who died, were buried in the village cemetery. The remaining six who baled out, all successfully evaded capture. Returned to the United Kingdom: 16th of August 1944. Four aircraft were detailed to carry out the above operation, with mines of 1500lbs. This was an unfortunate night as three aircraft failed to return and the other aircraft returned early having jettisoned its mines. This aircraft met an enemy night fighter and sustained damage to the port wing, starboard flap, rear turret and many large holes in the fuselage, the rear gunner, Sgt. W. HURDIE, was killed during the combat. The weather was bad and ten-tenths cloud made visibility poor. Navigation was good. The missing aircraft were Stirlings MKIII BF461, Captained by P/O.G.K.WILLIAMS, BK778 Captained by P/O.W.S.MASTERS and EE897 Captained by F/O. N.WILSON. Shot down, on the 4th of November 1943 during a mine-laying sortie to the Baltic Sea. After a heavy parachute landing which damaged his ankles he was picked up by the Danish Police and the Gestapo advised. He was taken to hospital where, thinking he was immobilised because of a feigned broken leg, he was left unguarded. He escaped and walked for 5 days before making contact with the Banish Underground Movement. He returned to England via Sweden being commissioned for outstanding bravery and awarded a Mention in Despatches. “I was a member of the crew of a Stirling aircraft which took off from Ely about 1600 hrs on the 4th of November 1943 on mining operations in the Skagerrack. At about 1916 hrs we were attacked by night fighters over Denmark and we were ordered to bale out. I was the first to leave the aircraft. I came down in the neighbourhood of Hundborg in marshy ground. I hid my parachute, mae west and harness in the swamp, along with a wallet I had been carrying. I had my wallet with me as we were returning to Lossiemouth and expected to be there for a week before going back to our station. I began immediately to walk away from the aircraft which was burning furiously about two miles away. I do not know which direction I took as there were no stars and I had lost my aids box and purse which I had inside by battle-dress before leaving the aircraft. Before starting to walk I removed all the badges from my uniform. I had sprained both ankles in landing and thought my right ankle might be broken. I kept on walking all that night (the 4th to the 5th of November) making slow progress as my right leg was almost useless. At dawn I rested for two hours and continue walking, this time East by the sun as I decided to make for the East coast. At 1100 hrs I was unable to carry on and sought shelter in a farm in the Hundborg area where I was given food and rested. At 1300 hrs, however, a Danish policeman arrived with an ambulance and explained I was to be taken to a Danish hospital at Tisted and that I would then have to be handed to the Germans. The farmer, though friendly, must have informed the police, probably being afraid of the German search. We passed many German search parties looking for me on the road. The Danish policeman was very anxious that they should not see me. He was also very friendly. At the hospital in Tisted the doctors treated my ankles, x-rayed my right foot and then said that there has been two British machines crashed, many had been captured, four more were dead (of this they were not certain and thought that I was the only one at large). They said that Flying Officer Black had been at the hospital with an injured foot. He had been captured by the Danish police and the Germans had taken him away from the hospital. Three Danish policemen arrived. I asked them to let me go, but they refused saying it was impossible to get to Sweden and that the Germans would recapture me. At 1600 hrs I was left in a ground floor room in the hospital by myself for a few minutes, but a porter came in and with his assistance I escaped through a window and made my way out of the town, dressed in battledress and flying boots. I walked East by the stars all night, along the shores of the lake (Tisted Bredning). It was bitterly cold, so I could not rest. I crossed a dyke in the vicinity of Hovsor. About 1000 hrs on Saturday. 6th of May, I was stopped on a track by a Danish peasant who saw I was in pretty bad condition. He took me to his house, gave me food and allowed me to rest until midday. An English-speaking Dane came in and gave me a map, an old map, and an old cap and showed me the main road to Aalborg. This road follows the railway line. He also said that it was impossible to get out of Denmark, but the people would help me. He advised me to avoid Pjersitslev, as there were many German soldiers there. I continued walking to 1900 hrs when I went to a farm where I was given food and a bed for the night. They spoke no English but managed to understand they were not to tell the police about me. I was given a better map which showed I was at Vust. On Sunday, the 7th of November, I was awaken at 0500 hrs and given food. I then set out along the road. About 0600 hrs I was stopped at a crossroads by two German guards but seeing my hat and coat they allowed me to pass. I did not speak a word. I walked all that day along that road passing several Germans. I was limping badly and my flying boots made walking a torture. At 1800 hrs I stopped at a farm near Birkekse. The people took me into a house, the owner of which, his wife an nephew all spoke English. They welcomed me with open arms, said they would help me, but were very pessimistic as to my chances, as the Germans were on the watch for me everywhere and many people were stopped on the roads. My host said he would try to put me in touch with an underground organization. I stayed there the night. Additionally, Frank was also interviewed regarding the specific individuals that assisted him. Date of interview 30 Dec 43. “On Sunday, 7 Nov, the people at a farm near BIRKELSE (Denmark, 1:1000,000, Sheet 9, 7751) took me to a doctor’s house in BIRKELSE. I stayed two nights with the doctor, who arranged for me to go to BIRSTED (Sheet 10, 8650). At 0600 hrs on Tuesday, 9 Nov I left the house at BIRKELSE accompanied by the doctors’s nephew, and went to BIRSTED, where I met Mr. MUNSTER, a parson, his Norwegian wife, and a young man named PETERSON. They appreared to have engineered escapes before. PETERSON went to AALBORG that day to arrange for an identity card for me and other details of my escape. I stayed all that day in his room. As they all wished to conceal me from the servants. That evening I had a long talk with him on sabotage activities and the underground organization, but I gathered nothing of much importance. They also took a photograph of me, as I had lost mine. Later another person came and it was arranged that at 1500 hrs the next day he would take me by car to his home at FREDERIKSHAVN (Sheet 4 and 5, 3475), and with luck I would soon be on a boat for SWEDEN. An identity card had been provided which stated I was Johannes CHRISTENSEN, a chemist’s assistant in AALBORG. I gave this to Mr. Larsen, assistant chief of police, FREDERIKSHAVN, when I was put on the boat. Next day, Wednesday, 10 Nov, I was given one of PETERSON’s hats and a mackintosh, and at 1500 hrs I left in the taxi with the second parson for FREDERIKSHAVN, arriving at 1700 hrs. I had tea at the parson’s house, being warned not to speak English before the servants. At 1830 hrs Mr. LARSEN took me by car to the house of a parson at AASTED (Sheet 4 and 5, 3677), where I was to be hidden till the boat was ready. This seemed to be the usual procedure and my host welcomed me and proved very hospitable. I stayed there that night. On Thursday, 11 Nov I remained all day at the parson’s house and at 1800 hrs Mr. LARSEN arrived in his car with the news that I was to board the ship at midnight. I returned with him to FREDERIKSHAVN and was left at a flat belonging to a friend of his. They told me they would call for me at 2330 hrs. This friend, a bank clerk and insurance agent, seemed to be the head of the organization in the district. I spent a very interesting evening with him. He gave me many details of sabotage, previous escapes and other underground activities. He said he had curtailed all sabotage activities that night, owing to my presence. We were visited later by one of the saboteurs who seemed rather indignant by this. Mr. LARSEN arrived at 2300 hrs and gave me details of the ship and instructions for boarding it, the ship being a small packet steamer belonging to a member of the organization and possessing German permission to operate as a cargo vessel in the SKAGERRACK. At 2330 hrs we left in Mr. LARSEN’s car for SAEBY (Sheet 4 and 5, 3164), South of FREDERIKSHAVN, and stopped near a wharf. I left Mr. LARSEN here and walked down a narrow street to meet a man who was to speak to me in English and take me on to the boat. I met the man and we boarded the vessel with the utmost caution. Once on board, my guide concealed me in the captain’s cabin with some food and strict instructions to stop there. The wharf was small, and the only vessels I saw were fishing boats and small steamers. I remained in the cabin all day Friday, 12 Nov, and the night of 12-13 Nov. No one came near me till the evening, when the man who had put me aboard came and said we would sail at 0800 hrs the next morning. Men were loading cases of empty bottles all day. No attempt was made by the Germans to search the vessel. We sailed at 0830 hrs Saturday, 13 Nov. The trip proved uneventful. I saw one small Danish steamer and one German plane (type unknown) equipped with a mine detector. We were sailing to COPENHAGEN, and the captain, who spoke no English, gave me to understand he would land on the Swedish island of VEN (Sheet 33, 49). At 2300 hrs I was awakened and made to hide in a cupboard for nearly half an hour. The ship’s engines going dead slow. Apparently a German patrol vessel had stopped just off the Swedish coast, but made no attempt to search the vessel. Shortly after midnight (Sunday, 14 Nov) we stopped about a mile from VEN and I was rowed ashore by the first mate and landed near a lighthouse. I made my way to the lighthouse, was given food and taken to a military H.Q. where I gave my name, number, etc., and remained there till 1530 hrs, when I was taken to LANDSKRONA and thence to HÄLSINGBORG Danish refugee camp. I first refused to give a statement till I had spoken to the British Consul, but, as it was late and the Swedish commandant could not get in touch with the Consul for me, he demanded my story. Remembering that Intelligence Officers had told me that evaders were laible to internment, I new thay my only wise course was to say I was an escaped prisoner of war. I said I had been in a German hospital South of the Danish border, which seemed to satisfy him. I spent the night at the camp. On Monday, 15 Nov I was put in touch with Mr. BLEAKLEY, the British Vice-Consul in HÄLSINGBOURG. And was taken to a hotel. On Tuesday, 16 Nov I travelled to STOCKHOLM and reported to Group Captain MAYCOCK, the Air Attache at the British Legation”. “It would appear that in DENMARK, with a 90 per cent pro-British population many whom speak English, escape chances from the country are particularly bright. It may be advisable to get well clear of the German search area and avoid all roads and bridges before attempting to get assistance. My opinion is that the first farm I went to would have helped me if I had been in better condition and the Germans search not so close. The best people are doctors, parsons, school teachers, and policemen. They are easy to locate, speak English, and nearly all are engaged in underground activities. Small farmers will help, but cannot speak much English and will not risk too much. Policemen met by chance are to be avoided, although many are engaed on escape work. Policemen near the crashed aircraft should be avoided. Once in the hands of the underground organization, obey orders and trust everyone implicitly. DO not ask any names, and never write anything. Avoid the servants in a household, and do not speak in front of them. Once in these people’s hands it is easy, but when and how to locate them remains with one’s own initiative”. Wellington Mk.III Z.1652 AA – ? Z1652 was shot down over France, crashing at Ville-aur-Retourne (Ardennes) on the south bank of the River Retourne, 13miles SSE of Rathel. The Captain and the navigator were both killed and were buried in the Ville-sur-Retourne churchyard. Sgt’s Worsdale, Newbold and Barnes survived. The first two evaded capture but Barnes was taken prisoner. LJ442 came under attack from a night-fighter (Lt Otto Fries, 5 /NJG1) a short time after take-off while en route to the target over the Belgian coast. After a series of attacks by the fighter causing considerable damage, fire broke out in LJ442’s starboard wing and a crash-landing attempt was made by the pilot at Horrues, NW of Soignies, Belgium. Only the captain, navigator and air-bomber survived. Parker and Griffiths evaded capture but Hyde, who was seriously injured, was taken as POW. The four who died were buried at Chièvres, 10 miles from Horrues. Eleven aircraft were detailed to carry out the above operation with bombs of 1,000 lb. and 4 lb. incendiaries. Nine aircraft are known to have successfully attacked the target, of the other two, one returned early owing to the mid upper and front turrets being u/s and the other aircraft failed to return. Fires were burning fiercely in the target area, although they appeared to be scattered. F/Lt. Trott had his aircraft damaged by flak at the target, the number two tank on the port side was holed, the trimming tab was hit and his aerial was shot off. He preceeded to Middle Wallop and landed safely. Both heavy and light flak was encountered which was intense at first but later spasmodic and appeared to be swamped. Searchlights were seen in the early part of the attack but later went out. Some enemy aircraft were seen but no attacks were made. The weather was very good with clear visibility and no cloud. Navigation was very good. The missing aircraft was Stirling 1 R9316 captained by Sgt. R.A. Williams. R9316 was hit by flak over the target and fire broke out. The Captain ordered the crew to abandon the aircraft and all but himself and the rear gunner parachuted successfully, landing near Plouay, (Finistère), 11 miles NNE of Lorient. Four were captured and taken prisoner but the fifth, Sgt Willis, RCAF, successfully evaded capture. The deceased, Sgt’s Williams and Harding-Smith, were buried at Guidel, near Lorient. The latter was the son of the Venerable Archdeacon T J Smith, of Nelson, New Zealand. The following is a transcription of Sgt. Willis’ M.I.9 interview. My aircraft, a STIRLING, left NEWMARKET about 1900hrs on 13 Feb to bomb LORIENT. I saw two other parachutes land safely, but I do not know the fate of any of the other members of my crew..
Over out target we were hit by flak and the petrol tanks caught fire. On our return flight, at about 2300hrs, while near PLOUAY, (Sheet 13), the pilot gave the order to bale out. I landed safely in a field, and could see two other parachutes landing not far off. I saw the aircraft burning on the ground. I took off my flying kit, mae west, and parachute, and hid them in a bush. I was not wearing shoes inside my flying boots so I kept my boots on. I then headed for a nearby wood. After a time I heard someone calling to me in what I took to be French. (I do not speak French myself.) This proved to be a boy of about 18. He asked if I was English and I managed to indicate that I was. He led me through some fields and woods and I lost my flying boots in a swamp during the journey. He motioned to me to hide near a road which I afterwards identified as the main road from PLOUAY to XXXXXXX (Sheet 13.) He then went away and half an hour later returned with three men. They asked me of proof of identity and I showed them my identity disc. They then took me for about a mile through some woods. At a house one of them procured for me some civilian clothes, a cap, and a pair of old boots. They then took me back into the woods, gave me a blanket, and told me to stay there for the night. Next morning, 14 Feb, two of them returned with some food, and a French-English, English French dictionary. I stayed in the wood till 17 Mar, my helpers providing me with food regularly. About 12 noon on 17 Feb, while talking to two of my helpers, we heard some Germans talking close to us. I immediately separated from my helpers and hid in another place till about 1600 hrs. I then saw two men walking about near my former hiding place but as I could not recognise them I did not show myself. About 1800 hrs I set out by myself, heading due East by the stars. About 0900 hrs on 18 Feb I reached QUISTINIC (Sheet 13), where I was given some food by a farmer. During my meal my host fetched a friend who was a teacher from LORIENT, and could speak some English. He told me that if I were to go to PLOERMEL (Sheet 13) I might get some help. He also suggest that later I might make South for ANGOULEME. I then went on and spent the night in a haystack near JOSSELIN (Sheet 13). Next morning, 19 Feb, I walked to PLOERMEL where I saw many Germans. I therefore decided to continue Eastwards. Between CAMPENEAC and AUGAN (Sheet 13) I got some food from a farm and slept in a haystack for the night. Next morning, 20 Feb, I walked through MALESTROTT to ST.LAURENT (Sheet 13), where I tried to buy food at a shop. They would not sell me anything. I rested for half an hour and then set off for ST.CONGARD (Sheet 13). About 1600 hrs I was overtaken by a man on a bicycle who took me back to the shop I had left and gave me some food. This man had been in a German P/W camp. When I had eaten he sent a boy to guide me to a relative of his nearby who had lived in CANADA for 30 years and who could speak English. This man proved to have lived quite near my own home in CANADA. An American pilot had been there two nights previously, and it was not thought safe to keep me longer. On the evening of 22 Feb I was therefore taken to another house, between MALESTROTT and ST.LAURENT. Here I was given fresh clothes, and a razor, and spent the night. Next morning, 23 Feb, a young man took me on a bus to RENNES, (Sheet 14), buying our tickets with money I gave him from my purse. At RENNES my helper bought me a ticket for ANGOULEME and put me on a train alone, about 1300 hrs. I was supposed to change trains at NANTES and at SAINTES. For some reason my train did not stop at NANTES but went straight through to ANGERS (Sheet 14), where I arrived about 1600 hrs. Here I boarded a local train, but when it started I realised that it was going East. I therefore got out at a small station the name of which I do not remember. Here I spoke to a woman railway official who bought me a timetable. Later a man approached me and spoke a few words of English. He and the woman made me understand that I should go to TOURS. The man boarded the next train back to ANGERS and I followed him. At ANGERS he spoke to a railwayman who took me to the correct platform for the TOURS train. When it arrived another railwayman put me into the train, with six Frenchmen also bound for TOURS. At 2100 hrs the train left. We arrived at TOURS about 2 hours later. We left TOURS a with one of the other Frenchmen. I caught a train at TOURS at 0100 hrs on 24 Feb and arrived at ANGOULEME in the early morning. Neither at TOURS nor ANGOULEME did anyone ask me to produce any papers. I had no idea where to go when I arrived at ANGOULEME (Sheet 24). The Frenchman left me, so I walked to the outskirts of the city and sat in a bush for a while. I then started walking along the ANGOULEME-RIBERAC high road. That evening, somewhere on this road, I stopped at an isolated house and asked for a drink. A man in the house invited me to come in. He could speak a little English, and had been in a German P/W camp. He gave me food and shelter for three days. On the morning of 27 Feb on of this friends took me in a car to RIBERAC, where he left me at another house. Later that morning another man came and took me by car to PERIGUEX (Sheet 30).I stayed in a house here until 1 Mar. During this time I had my photograph taken and was provided with false identity papers. About 2200 hrs on 1 Mar a friend of my host took me by train to PAU (Sheet 39). I gave him what money I had left towards the cost of my ticket. At PAU I stayed in a small hotel from 2- 4 Mar. On the morning of 4 Mar a friend of my companions took me to OLORON by bus. At OLORON out identification papers were checked by the French. From OLORON we went by bus to TARDETS (Sheet 39). During this journey Germans twice boarded the bus and checked our identification papers. We arrived at TARDETS about 1600 hrs. I was taken to a house where there were six Frenchmen and two Frenchwomen, whom I was told were waiting for a guide to the Spanish frontier. (Later, when I was in SPAIN I heard from a Frenchman that the householder had been arrested by the Germans). About 2230 hrs on 4 Mar the whole party set off with a Basque guide. About 0500 hrs on 5 Mar we reached the high ground to the West of the River LE SAISON (Sheet 39). Here we hid till midnight. We could see some lights in LARRAU, and our guide said that these were the lights of Germans searching the village. Our guide knew the country extremely well, for we seldom followed any trail and he was never lost. A little after. A little after midnight 5/6 Mar, we went up the valley of the River LE SAISON, S.E. of Pic BISCARGE (Sheet 39) and thence followed down the River URCHURIA (Sheet 39), till we came to a farm at about 1500 hrs on 6 Mar. Here we found some Spanish carabineros. One of the women in the party undertook to explain who we were. In consequence the Spaniards took me for a French civilian. We stayed in the farm that night. Next morning, 7 Mar, the carabineros took us to ABAURREA ALTA (FRANCE, Sheet 39), where we were accommodated in different houses until the morning of 9 Mar. My French companions paid for my food and lodging. About 0600 hrs on 9 Mar we were taken to PAMPLONA and handed over to the Chief of Police. Here they took aour particulars. I was still regarded as a French civilian. The men in the party were then sent to prison. Before I went, I gave my ring and my identity to one of the women in the party. I believe that she managed to get to BILBAO and tell the British Consul of my fate. Later I wrote from prison to the British Embassy at MADRID. I remained in prison till 6 Apr. Next day a representative of the British Embassy took me to MADRID. From here my journey is as described in the respect of S/Ldr. LOGAN (S/P.G. (-) 1174) and F.Sgt. JENNINGS (S/P.G. (-) 1175). I arrived at GIBRALTER on 17 Apr 43. Wellington Mk.III Z.1652was shot down over France, crashing at Ville-aur-Retourne (Ardennes) on the south bank of the River Retourne, 13 miles South South East of Rathel. The Pilot and the Navigator were both killed and were buried in the Ville-sur-Retourne churchyard. The Air Force Museum of New Zealand has just presented another 75(NZ) Squadron RAF related item in it’s ‘Object of the week‘ series. This time it is a set of forged identity documents that Edwin Worsdale used to escape back to the United Kingdom with after he was shot down at 00:30 on the night of the 25th October 1942. Owing to adverse weather conditions, the crew had failed to reach the necessary height to cross the Alps and the decision was made to abort only their 5th Op as a crew and return to Mildenhall. Whilst on their return flight over France, Edwin and crew, skippered by Howard Hugill crashed after being attacked by an ME110. Unable to maintain height, one crew member, James Barnes the Air Bomber, baled out prior to impact, but the rest crash landed, resulting in the Pilot, Sgt Howard James Hugill, RNZAF NZ414293 and Sgt. Edmund John Pete, RAF 1279494 the Observer, being killed in the crash, approximately 30 kms east of Reims. Edwin and another crew member, Sgt. Newbold made off on foot from the site of the crash, reaching Switzerland 18 days later, having been provided assistance by French families along their 30km a day escape. Whilst in Switzerland, Edwin spent 9 months at the British Embassy in Geneva as a cipher clerk. 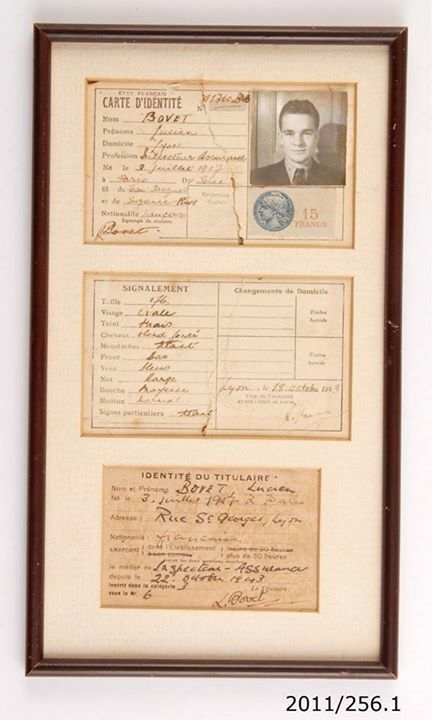 On the 5th of June 1944, Edwin left Switzerland for Spain, briefed by the British escape and evasion representative in Switzerland and carrying the necessary forged documents to assist in his escape – under the alias ‘Lucien Bovet’, an insurance inspector. His initial train journey took him to South Western France and in order to get to Spain he crossed the Pyrenees unassisted. On arrival in Spain, he gave himself up to the Spanish authorities and was released to the charge of the British Embassy. 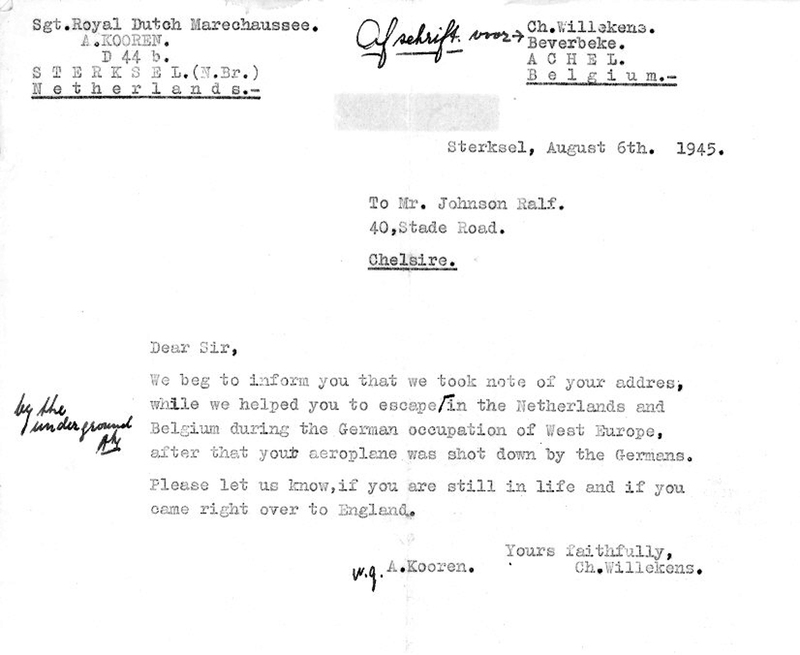 Edwin returned to the United Kingdom, via Gibraltar on the 11th of July 1944. 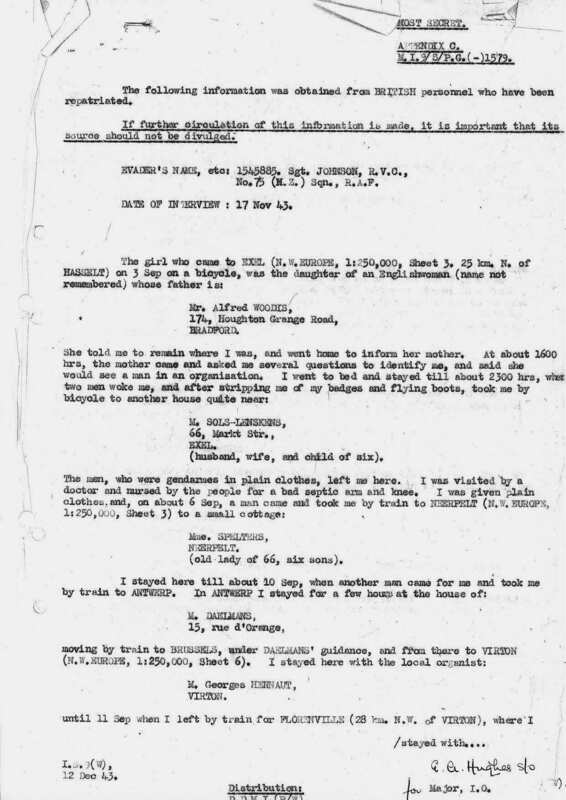 On his return to the United Kingdom Edwin was interviewed and debriefed by Intelligence School 9 (I.S.9), which had as its chief task the support and rescue of escaped POWs and Evaders (E&E’s) stranded in enemy territory in Europe. I.S.9 activities fell under M.I.9 (British Directorate of Military Intelligence Section 9), a department of the War Office during WW II. “I was a member of the crew of a Wellington Mk III aircraft which took off from Mildenhall on the 23rd October 1942 to bomb Milan. On the outward journey we could not get the aircraft to rise above 12,500 ft whereas we required to rise to 14,000 ft when approaching the Alps. The pilot accordingly turned back. We were uncertain of our position but thought that we were well south of Paris. We then flew out of cloud and were hit at about 10,000 ft by a fighter, the rear turret being put out of action. The pilot took evasive action, diving to about 3,000 ft in the hope of being able to hedge-hop home. However, first the instruments and then the motors went out of action, and fire started in the bomb bay where we had a full load of incendiaries. We crash-landed. 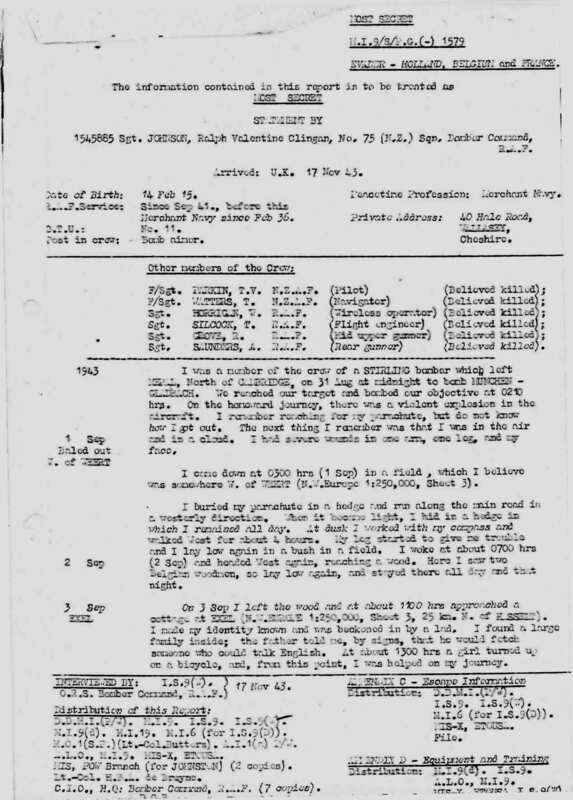 The bomb aimer (J G Barner) had already baled out and I learned a year later in Switzerland that he was a P/W in Germany. Before we hit the ground we jettisoned the incendiaries but the fire was pretty bad. In spite of this the pilot made a magnificent landing about midnight. We came down in a ploughed field between a wood and a village, possibly Menil- Nelles. And certainly about 20 20 west of Vouziers. The rear gunner was trapped in his turret, but I was able to push his turret from the inside and so make an opening for him to get out. I then took off all my equipment and after the rear gunner had pushed the turret round for me, I was able to get out through the same opening. We had just got clear from the aircraft when the petrol exploded. We were unable to get at the Pilot and Navigator who were still in the aircraft. We did not know at that time that the Bomb Aimer had baled out and thought he also was in the aircraft.